The Board of Management of Abbey Community College has been granted conditional planning permission for a development at the school. The application for a single storey extension comprised of: A new ASD Unit: 2 no. classrooms, daily living skills room, multi-sensory room, store, toilets and shower facilities, link corridor with connection back to existing school and all associated site works at the college. The application was lodged with the local authority on November 7th 2018. A decision was granted for the development on the 20th of December 2018 and contained 8 conditions. If you and/or your family need food, we distribute food through Community FEAD and Food Cloud programmes at Boyle Family Resource. All you have to do is text FOOD and your first name to 086 049 6467 to receive details. Distribution times are as follows: Monday 2.30pm until 4pm, Wednesday 2.30pm until 3.30pm or Friday 3pm until 4.30pm. Tickets are now on sale for Abbey Community College’s production of ‘All Shook Up’. The musical will take place in St. Joseph’s Hall on February 13th, 14th and 15th at 8pm. The Booking Office is open in the school Monday to Thursday 1.15pm to 1.45pm and 4pm – 4.30pm. It is also open on Friday’s from 1.15pm to 1.45pm. Tickets must be paid for in full by cash or cheque at time of booking. (No credit card facility) Bookings must be made in person at the Booking Office (Parents Room). No phone booking available. Please do not call to the school office to book. The first round of the Spring League had been due to take place on the weekend of the 2nd and 3rd of February but the persisting low temperatures forced the closure of the course for the 2 days. The big event in the club calendar for February is the Captains and Lady Captains “Drive-In” on Sunday the 24th of February when respective captains Seamus Gallagher and Regina McLoughlin will get Boyle’s golfing year off to its official start. We ask all members to come along to this most social of occasions and show support for the for the year. The format of the competition itself on the day will be a 9 hole scramble for ladies and gents, ideal for getting the rust off after the winter months. One of the clubs greatest assets has been the willingness of many members to engage in voluntary work on behalf of the club whether that be in the clubhouse or out on the course. It is hoped that voluntary work on the course will re-commence this year from the 16th of February. If you are interested in helping out in any small capacity during the year , please make contact with Volunteers Co-ordinator, Michael Rush. The term of 2019 Junior Tennis Coaching will commence on Wednesday 6th March. Lesson times are 3:30-4:30 / 4:30-5:30 / 5:30-6:30 dependent on age and standard. This will be a 6 week term costing. All equipment is provided. Booking is essential – please contact Tim our Tennis Ireland qualified coach on 083 1155374 to book your place!! Please arrive 15 minutes before the start time of your first lesson to allow time for processing new season 2019 membership registration payments and coaching fees. ‘Grow Remote’ – a new nationwide group who aim to uncover and build a full community around remote working will hold one of their first events in this area in the Spool Factory in Boyle in February. Grow Remote believe that both Roscommon and Leitrim are very suitable for remote working. The groups aim is to uncover and build a full community around remote working in this region, and the first thing they plan to do is meet up and get the ball rolling. The first meeting in this area will be held in The Spool Factory in Boyle on Tuesday February 12th with a second event in The Hive in Carrick on Shannon the following night. Grow Remote organisers would love to meet remote workers, job seekers, employers and anyone else interested in developing the sector for a free meet up. All are welcome” The Grow Remote community consists of co-working managers, freelancers, nomads, remote workers and remote working companies who believe that all 3 i.e. jobs, workers and communities need to move together to enable our communities to thrive. If you are any of the above, please keep Tuesday February 12th and Wednesday 13th in your diary. The County Leitrim Percy French Society will be at Tawnytaskin Community Centre Boyle on Sunday 10th March at 8pm SHARP. Contact Ann on 086 8130005 Tickets are €10 and are available in the following outlets; Boyle Credit Union, Adam’s Apple Fruit & Veg Boyle, Úna Bhán Tourism Grounds of King House Boyle. Proceeds in aid of Tawnytaskin Community Centre. 40 years of original hits by the famous Bagatelle will be taking place in Teach Murray on Friday 15th March. 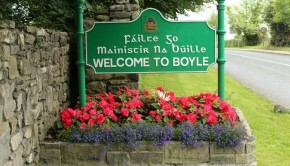 Tickets available in Una Bhan Tourism in the grounds of King House, Boyle. For further information, call 071 966 3033. FOTOFIT Camera Club have been together happily snapping for the past three years. Excitement is building as we get ready for a special exhibition to be held later this year. The theme is ‘Town Doorways’ and we invite interested parties to get involved. The club would love to partner up with the people who own or work behind these doorways, be they business or private. If you are interested in letting us photograph your town door and possibly you outside it or if you require any further questions, then please contact Veronica at 086 377 6258 voconnor@bocros.org or Sharon at 966 3146. Abbey College, Boyle students are busy finalising their entries for ‘ Junk Kouture 2019’ .The ACC groups consist of Robin Wilson, Sophie Quinn, Amy O’Neill and “Its Bark is Worse Than it’s Bite” created by Nicole Reilly and Ronan Dwyer. Junk Kouture is an all island competition for secondary school students which takes elements such as fashion, design, engineering and environmental sustainability and transforms them into a creative contest like no other. Inspiring young designers in second level education to use everyday junk materials to create striking works of wearable art, the competition calls on all budding fashionistas to see if they have what it takes to be crowned King or Queen of the upcycled catwalk. Hitting its ninth year running, Bank of Ireland Junk Kouture has already captivated over 24,000 students, 7,000 teachers and 100,000 audience members.